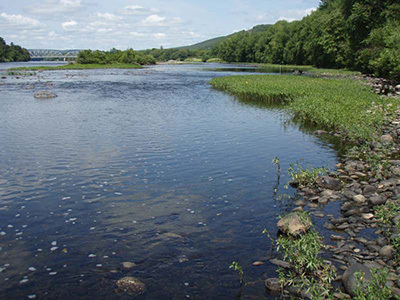 EcoLogic conducted freshwater mussel and aquatic habitat surveys in the Delaware River in the City of Port Jervis in support of the city’s efforts to build a proposed whitewater park and habitat improvement project along the New York side of the river. The mussel survey was required to determine if dwarf wedgemussel (Alasmidonta heterodon, a federally and New York State endangered species) and brook floater (Alasmidonta varicosa, a New York State threatened species) were present within the project area. A field survey for these species was conducted in a 1,300-meter reach of the river using snorkeling and viewing buckets as the means of searching for mussels. All mussels (species of concern and otherwise) encountered were identified and enumerated. Specimens of species of concern were individually measured. The locations of all encountered specimens of species of concern were noted on a base map of the study area, and the GPS coordinates of the location recorded. Locations of non-target mussel species also were recorded. General habitat conditions, search time, and specific habitat used by any of the species of concern were recorded. The survey area, selected habitats, and species of concern found at the project site also were photo-documented. Following completion of the field survey, a report was prepared that provided a description of mussel species composition, abundance, and distribution in the surveyed areas, an assessment of potential impacts of the project to protected mussel species, and recommendations for avoiding such impacts. A baseline aquatic habitat survey was conducted in conjunction with the freshwater mussel survey. This was accomplished through a field effort documenting general aquatic habitat types (e.g., areas of pool, riffle, and run habitat), river bottom (substrate) composition, types and extent of aquatic vegetation present, water depth, and current velocity characteristics. The project area was divided into 50-m sub-reaches, and habitat within each of these sub-reaches was characterized. Observations of fish and wildlife use of the river were recorded during the field effort, and representative photographs of aquatic habitats were taken to further document habitat conditions. Additional information on expected fish and wildlife use of the aquatic habitats in the project area was gathered by contacting regional NYSDEC staff familiar with the locale to obtain available information on fish and wildlife species that would be expected to use the project area but that were not observed during the field survey. Potential impacts to documented habitats at the site were determined by reviewing proposed project plans and consulting with the designers of the project to determine which habitats might change and how. The expected resultant habitat was then evaluated to determine how fish and wildlife use might change, either negatively or positively. EcoLogic was subsequently hired to assist the project engineering firm to provide support in addressing issues related to threatened and endangered species (TES) potentially affected by construction and operation of the proposed whitewater and habitat improvement project. Services provided by EcoLogic include compiling information on TES and determining the need for additional field studies, addressing additional information requests related to the presence of dwarf wedgemussel in the project vicinity, and preparing a biological assessment to evaluate the potential effects of the proposed project on the federally endangered dwarf wedgemussel.